When you race in Kona, odds are good that you'll face the legendary headwinds in the lava fields for at least the last 30 miles of your bike ride, if not more. When the winds are howling at 40 to 50 mph gusts, almost lifting riders off the road, that's Kona at its most devious. Some years, the headwinds are intense; other years, a tailwind helps you sail on the Queen K Highway. 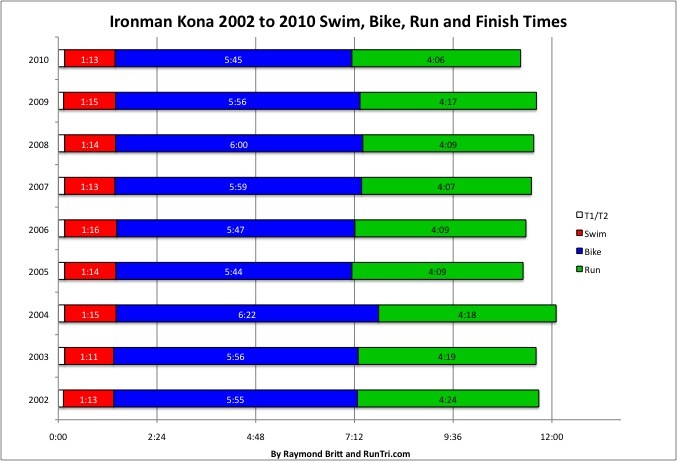 The winds were at top force in 2004, and the difference in overall finish times is clear: a 6:22 bike split was the defining factor in the only race in Kona since 2002 that had an average finish time over 12 hours. Not surprisingly, 2004 saw a remarkable 9% DNF rate as well. Yet, the next year featured most enjoyable tailwinds, leading to substantially faster times. For more, see our Complete Ironman Kona Coverage.